Ready, set, GO! Stage two of our GO! SOLUTIONS packaging upgrade is in full effect with the transition of FIT + FREE to CARNIVORE. With the same nutritious and delicious flavours your pet knows and loves, and the launch of NEW recipes packed with drool-worthy animal proteins, the CARNIVORE collection satisfies pets with decidedly carnivorous preferences, supports protein digestion, and helps maintain strong, lean muscles. Are you discontinuing the GO! 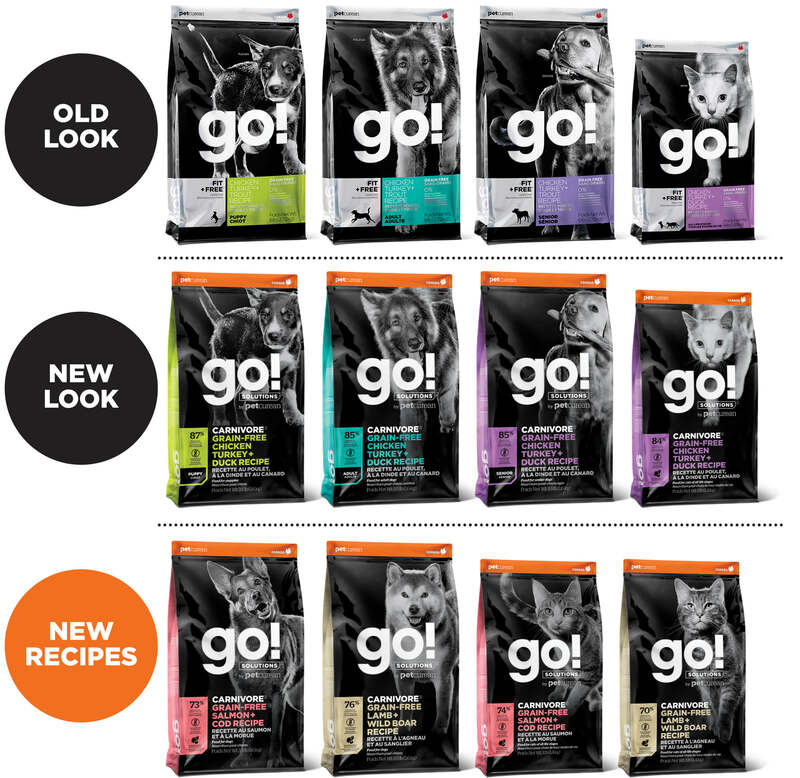 FIT + FREE Puppy, Adult, and Senior recipes for dogs, and the GO! FIT + FREE Chicken Turkey Duck recipe for cats? Nope! We are happy to continue to provide these high meat recipes under the new and improved GO! SOLUTIONS CARNIVORE name. Why are you changing the product line name from GO! FIT + FREE to GO! SOLUTIONS CARNIVORE? Some pets have decidedly carnivorous preferences and pet parents seek out high protein diets to satisfy their nutritional needs. By repositioning these recipes under the CARNIVORE collection, we are clarifying their “meaty meat meat” qualities and helping our customers choose recipes packed with drool-worthy animal proteins to support their pets’ muscle development. What makes these recipes a good option for pet parents seeking high meat protein diets? GO! SOLUTIONS CARNIVORE is Petcurean’s line of high meat protein recipes. 70% to 87% of the protein in each recipe comes from animal sources, and each recipe contains 6 to 11 premium quality fresh meats and meals for maximum protein and palatability. Protein requires a little extra time and energy for the body to digest; we’ve included digestive enzymes, probiotics, and prebiotic fibre to promote good digestion, protein utilization, and nutrient availability to ensure pets get the most nutritional bang for your buck. If my pet has lots of energy, is a high meat protein recipe the best choice for them? The body needs protein for tissue and muscle repair, so a high protein recipe can be a good choice for active pets. Any unused protein will be stored in the body as fat or excreted out in the urine, so if your pet prefers lazy afternoons on the couch over a game of fetch, a more moderate protein option might be the best choice. Energy itself comes primarily from fat and carbs. These nutrients tend to get a bad rap but they’re crucial for a pet’s health and longevity, so look for recipes that offer a good balance of all three. Why aren’t you repositioning all the GO! SOLUTIONS recipes at the same time? With sustainability as a priority, we are repositioning the GO! SOLUTIONS collection in phases to work through existing product, packaging, and ingredient inventory to minimize waste as much as possible. Are you making any changes to the bag sizes? What will this mean for your frequent buyer program? We are reducing the size of our small and large bags to provide optimal price points for new consumer trial and existing consumer loyalty. Small GO! CARNIVORE bags will transition from 6lb to 3.5lb for dogs and from 4lb to 3lb for cats; large GO! CARNIVORE bags for dogs will transition from 25lb to 22lb; large GO! CARNIVORE bags for cats will remain at 16lbs. We will happily honour the frequent buyer card transition for customers currently on a small or large bag program; please speak to your local pet specialty retailer or call our Nutrition Hotline at 1-866-864-6112 to understand your options.